Occasional musings about the intersection of education, science and the maker movement. I have a new book coming out - should start to go on sale next week. It's called Mastering 3D Printing, from Apress. 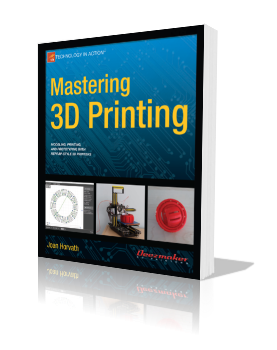 I've intended it to be the book that I really would have wanted when I got into 3D printing last year - a comprehensive how-to guide that teaches the reader how to really use a printer, from zero on to real projects. The publisher's page has the table of contents and all that good stuff. This book would have been impossible without the input of the many people in the 3D printing community in general and the good folks at Deezmaker in particular who helped teach me about the field. Rich Cameron (aka Whosawhatsis) was the technical reviewer for the book. I hope it gets a lot more folks into the field! This page is an accumulation of info about our activities and things of interest to our friends and colleagues. 3D printing classes - some openings next week!